Today Chrysler announced that it would offer in-vehicle wireless chargers. The device, which comes out of Chrysler’s aftermarket division, Mopar, will be available for the 2013 Dodge Dart, which will debut in the second half of 2012. The accessory feature will retail for $199 plus installation. When installed, it is seamlessly integrated into the bin that sits in front of the center console, underneath the head unit and climate controls in the center stack. The unit will come with a special phone case that will allow your device to be charged whenever the vehicle is on. 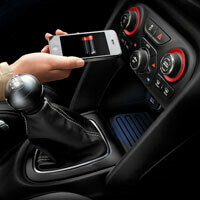 For techies and mobile enthusiasts alike, the 2013 Dodge Dart is also slated to feature vehicle-information apps for customer’s smartphones, Electronic Vehicle Tracking System (EVTS) that is able to text an owner when the car is driven too fast or outside a designated area, the ability to turn the vehicle into a Wi-Fi hotspot, and WiTECH wireless vehicle diagnosis. Definitely, I think (and hope) Fiat's involvement will take the company in the right direction. god i hope so. dodge has been dodgy.. for quite some time. The trucks are OK, but those cars are horrible. might as well be GM. This is sweet! I'm glad to see Dodge moving forward. This is kinda of topic but, has anyone seen the new 2013 Dodge Viper? It's bada**! i saw the teaser pictures a few days ago but i just looked up some more and it looks pretty nice. looks kind of like a Lotus Elise/Nissan 350Z/Dodge Viper Love Child. It's actually no longer going to be called a Dodge. It's going to start it's own "brand" entitled SRT. So it's the SRT Viper. The Challenger/Charger/and 300 will soon follow suit. When the car is driven "to fast"? Someone is going to make it stop eating? If they were smart they would use the same 2.4 turbo set as they used in the srt 4 line the neon, caliber, and the PT even though the PT wasnt considered a SRT car. Than added all the fancy technology that would be a hell of a car than. Also as much as I love chargers they should not be 4 doors. i like that the Charger is 4 door. the Challenger is the 2 door even though it's kind of big. the original challenger was a two door and big.. same with the charger. if they are gonna remake something remake it how it should be. yeah so? the Charger was even bigger back in the day so what? we have a 2 door muscle car and a 4 door muscle car now. that's better than having a pair of 2 door muscle cars. the world isn't the same anymore especially with the economy. It shouldnt be called a Charger than. Dont remake something and have it not look enclose how it use to look it doesnt make sence. xD all you're complaining about is a second set of doors. it's not like it was a two seater before.